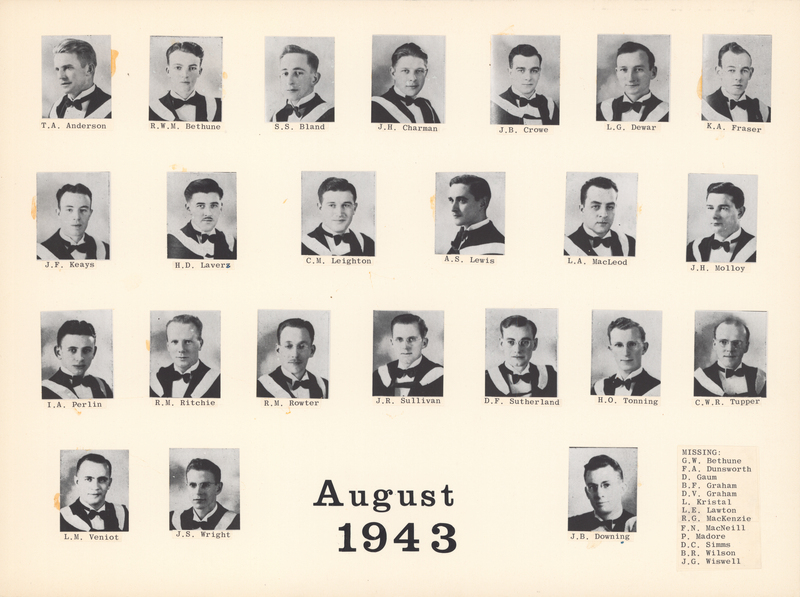 File is a composite photograph the Dalhousie Faculty of Medicine Class of 1943. Photograph includes 23 photocopies of individual student portraits. Composite photograph includes portraits: T.A. Anderson; R.W.M. Bethune; S.S. Bland; J.H. Charman; J.B. Crowe; L.G. Dewar; K.A. Fraser; J.F. Keays; H.D. Laverz; C.M. Leighton; A.S. Lewis; L.A. MacLeod; J.H. Molloy; I.A. Perlin; R.M. Ritchie; R.M. Rowter; J.R. Sullivan; D.F. Sutherland; H.O. Tonning; C.W.R. Tupper; L.M. Veniot; J.S. Wright; J.B. Downing.